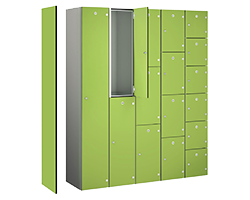 This Probe Slim Wardrobe Cupboard has one full width shelf and one hanging rail. It comes in a Commercial Version (UDL 65kg) or for heavier use choose the Industrial version (UDL 85kg). As with most of the Probe cupboards, pick from 6 door colours and 3 carcass colours, to give your cupboard a unique look. The new black carcass range adds a very sleek look, and maybe add a brightly coloured door to make a statement. Please review our Delivery Terms before placing your order.